After soliciting $1.27 billion in donations in less than two years, MIT appears to be ahead of its capital campaign goal of raising $1.5 billion by the end of 2004. Early in the campaign, a number of extraordinarily large gifts helped get the campaign moving quickly, including a $100 million donation by Kenan E. Sahin ’63. Sahin announced his donation during the campaign’s kickoff event. The Campaign for MIT has already exceeded the goals for unrestricted donations and those allocated to faculty chairs. However, Hecht said that some campaigns have received less attention from donors. Dare said that “this is the first time I’ve seen this category, so it’s been a new challenge. You have to communicate to alumni what their money is going for.” MIT is currently creating a pamphlet that outlines how donations to Undergraduate Education and Student Life will be used. Hecht said that MIT will coax undecided donors to contribute toward the student life fund. 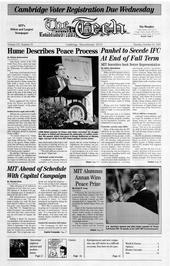 Clay noted that increasing the size of MIT’s endowment helps to supplement the annual budget. “Income from the endowment also helps support the general budget so as to limit pressure to increase tuition, room rents and fees,” he said.